SHERWOOD — Sure, the cross country season ended months ago. But the Bowmen just keep on running — and winning. Sherwood High School junior Henry Giles, and sophomore Jaron Homer, who helped the Bowmen boys cross country team win its first district title in 22 years this past fall, have helped the Sherwood boys track and field team get off to a super fast start to the 2018 season. "Cross country showed us what we can do," said Giles, who was victorious in the 1,500-meter run when the Bowmen teams faced Tigard and Lake Oswego in a league meet. "It's kind of exciting." "It pulled us through the winter," added Homer, who was second in the 1,500. 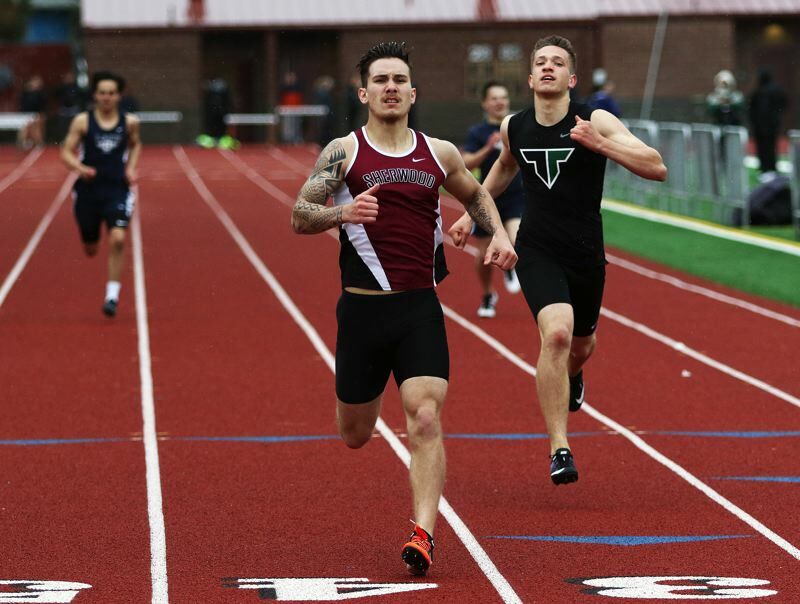 With the distance crew helping lead the way, the Sherwood boys moved to 4-0 in Three Rivers League meets by sweeping Tigard (83-62) and Lake Oswego (116-29) in the league double dual meet held April 11 at Sherwood High School. "We're going to be a good distance track team," Giles said. That showed during the meet with Lake Oswego and Tigard. 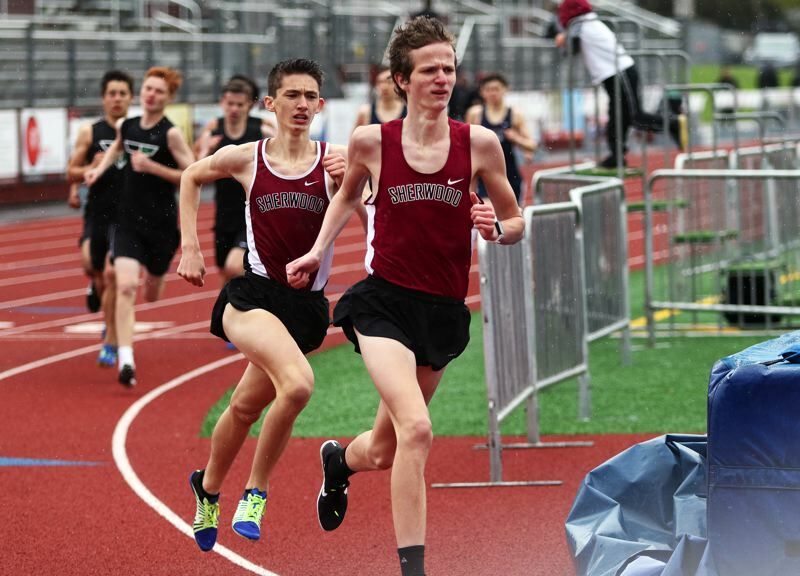 In addition to the one-two finish by Giles and Homer in the 1,500, Bowmen sophomore Thomas Osborne, another member of the cross country title-winning team, triumphed in both the 800 and 3,000. "We have just three of our top seven (from cross country)," Homer said. "But that's all you need for track, and we've improved a lot. Since last year, we've all improved by about 20 seconds." "We're still going to be strong," Giles said. In the 1,500, Giles, despite just getting over illness, lead from start to finish, and won the race in a time of 4 minutes, 11.87 seconds. "I felt awful the entire time," he said with a laugh. "I'm not going to lie." Homer, right behind Giles the entire race, placed second with a mark of 4:16.39. "It was pretty good," he said. "I felt kind of dead." "Yeah, it was surprising how strong we ran today," Giles said. "I wasn't expecting that. I thought we'd go out and try to win, maybe at around 4:20, or maybe in the teens." Osborn ran to victory in the 800 in a time of 2:04.83 and he had a winning mark of 9:53.94 in the 3,000. Other members of the Sherwood boys team also picked up individual wins on the track. Sophomore Caleb Hagan sprinted to victory in the 100 in 11.62. Senior Andrew Mabry triumphed in the 400 in 53.89. In the 4 x 400 relay, Hagan and Mabry teamed with juniors Michael Klapp and Michael Muller to get a victory in 3:38.99. 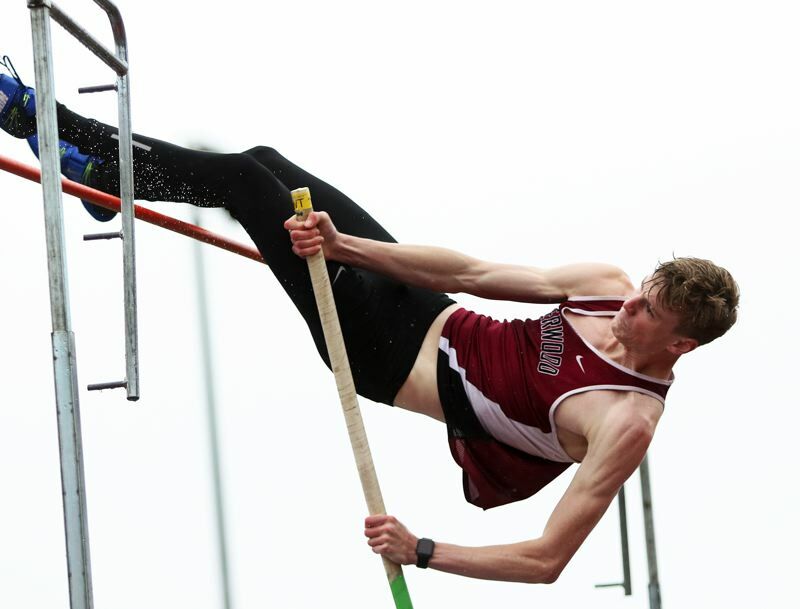 The Bowmen also found success in the field events. Freshman Noah Culbertson won the shot put with a mark of 49 feet, 4.5 inches. Freshman Bryan Cuthbertson had a winning throw of 131-10. Senior Payton Churilla cleared 13-0 to take first place in the pole vault. The Sherwood girls also came away with a sweep in last week's meet. The Lady Bowmen defeated Tigard 82-63 and they bested Lake Oswego 97-48 to improve to 3-1 in league dual meets. Freshman Joley Sproul had a big day for Sherwood, as she was a four-time winner at the meet. Sproul triumphed in the 100 high hurdles in 17.77, she had a winning time of 50.64 in the 300 low hurdles and she cleared 4-10 to take first place in the high jump. Sproul also teamed with freshman Nora Hagan, freshman Kylah Williams and junior Alex Verkamp to win the 4 x 400 relay in 4:18.19. Senior Shelby Moran picked up a pair of wins in the throws. She took first place in the discus with a mark of 153-3 and she won the shot put with a distance of 42-9.75. Lady Bowmen senior Clair Johnson also broke 40 feet in the shot put with her second-place throw of 40-4. Nora Hagan won the 200 in 26.36 and junior Alice Hall cleared 8-6 to take first place in the pole vault. 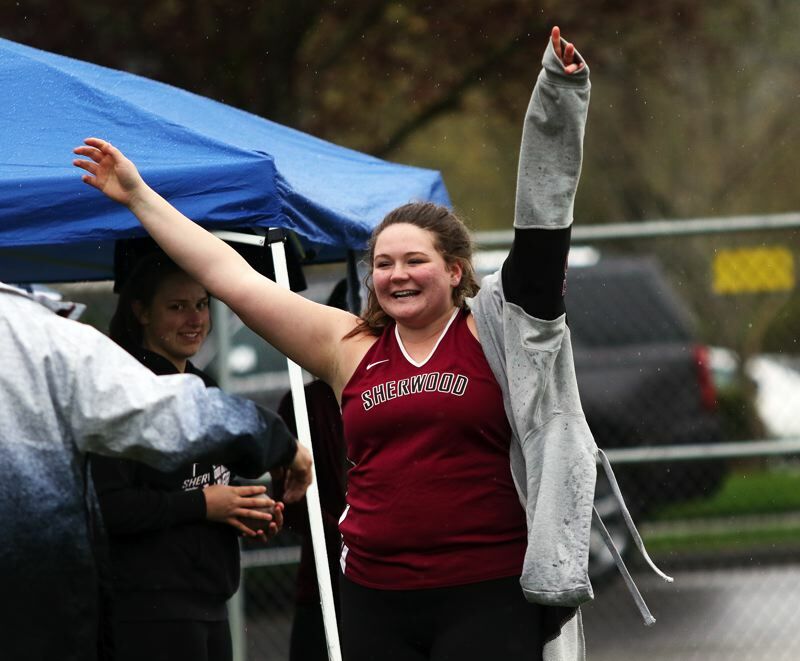 On Friday and Saturday, Sherwood competed at the Oregon Relays, held at Hayward Field in Eugene. Moran won both the discus, with a throw of 160-8.25, and the hammer throw, with a mark of 179-6.25. Churilla was sixth in the pole vault at 13-5.5 and Giles took ninth place in the 3,000 in a school-record time of 8:40.63. The Sherwood teams are scheduled to host St. Mary's Academy (girls only) and Tualatin in a league double dual meet on Wednesday. Results of that meet weren't available when the Times went to press. 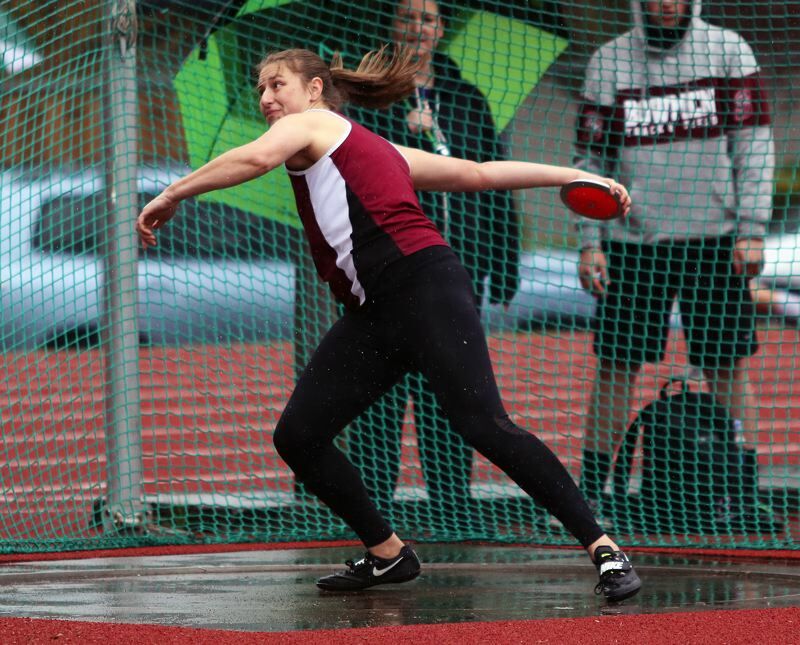 The Bowmen will also be in action on Saturday, when they compete at the Wilsonville Invitational.